copyranter: MTV Germany pays tribute to Michael Jackson's dead legs. copyranter on ANIMAL NY: The Cli-Matrix. Christmas Evil: the two worst X-Mas ads ever. copyranter on ANIMAL NY: Shake-N-Bake. copyranter on ANIMAL NY: Save The Animals! MTV Germany pays tribute to Michael Jackson's dead legs. 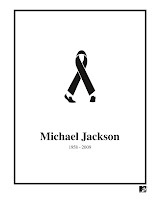 (click ad, via) Many art directors will no doubt dig this graphic MJ tribute ad by BBDO Düsseldorf for MTV Germany. But it gives me the heebie-jeebies—imagine it as a lapel ribbon. Previously in: wacko Jacko ads. Related: Levi's quickly puts their jeans on Ted Kennedy's dead legs. It looks like an AIDS ribbon with feet. Good ad for AIDS awareness, if that's actually what did him in... but it wasn't. So this is just to promote Michael Jackson's death awareness? Thank Christ cause not nearly enough people are familiar with that tragedy.